For other uses, see Aventinus (disambiguation) and Aventine Renewable Energy. The Aventine Hill (/ˈævɪntaɪn, -tɪn/; Latin: Collis Aventinus; Italian: Aventino [avenˈtiːno]) is one of the Seven Hills on which ancient Rome was built. It belongs to Ripa, the twelfth rione, or ward, of Rome. Temples to Diana, Ceres, Liber and Libera, Bona Dea. The Aventine Hill is the southernmost of Rome's seven hills. It has two distinct heights, one greater to the northwest and one lesser to the southeast, divided by a steep cleft that provides the base for an ancient roadway between the heights. During the Republican era, the two hills may have been recognized as a single entity. The Augustan reforms of Rome's urban neighbourhoods (vici) recognised the ancient road between the two heights (the modern Viale Aventino) as a common boundary between the new Regio XIII, which absorbed Aventinus Maior, and the part of Regio XII known as Aventinus Minor. Most Roman sources trace the name of the hill to a legendary king Aventinus. Servius identifies two kings of that name, one ancient Italic, and one Alban, both said to have been buried on the hill in remote antiquity. Servius believes that the hill was named after the ancient Italic king Aventinus. He rejects Varro's proposition that the Sabines named the hill after the nearby Aventus river; likewise, he believes that the Aventinus who was fathered by Hercules on Rhea Silvia was likely named after the Aventine Hill. The Aventine was a significant site in Roman mythology. In Virgil's Aeneid, a cave on the Aventine's rocky slope next the river is home to the monstrous Cacus, killed by Hercules for stealing Geryon's cattle. In Rome's founding myth, the divinely fathered twins Romulus and Remus hold a contest of augury, whose outcome determines the right to found, name and lead a new city, and to determine its site. In most versions of the story, Remus sets up his augural tent on the Aventine; Romulus sets his up on the Palatine. Each sees a number of auspicious birds (aves) that signify divine approval but Remus sees fewer than Romulus. Romulus goes on to found the city of Rome at the site of his successful augury. An earlier variant, found in Ennius and some later sources, has Romulus perform his augury on one of the Aventine Hills. Remus performs his elsewhere, perhaps on the southeastern height, the lesser of the Aventine's two hills, which has been tentatively identified with Ennius' Mons Murcus. Skutsch (1961) regards Ennius' variant as the most likely, with Romulus's Palatine augury as a later development, after common usage had extended the Aventine's name – formerly used for only the greater, northeastern height – to include its lesser neighbour. Augural rules and the mythos itself required that each twin take his auspices at a different place; therefore Romulus, who won the contest and founded the city, was repositioned to the more fortunate Palatine, the traditional site of Rome's foundation. The less fortunate Remus, who lost not only the contest but later, his life, remained on the Aventine: Servius notes the Aventine's reputation as a haunt of "inauspicious birds". According to Roman tradition, the Aventine was not included within Rome's original foundation, and lay outside the city's ancient sacred boundary (pomerium). The Roman historian Livy reports that Ancus Marcius, Rome's fourth king, defeated the Latins of Politorium, and resettled them there. The Roman geographer Strabo credits Ancus with the building of a city wall to incorporate the Aventine. Others credit the same wall to Rome's sixth king, Servius Tullius. The remains known as the Servian Wall used stone quarried at Veii, which was not conquered by Rome until c.393 BC, so the Aventine might have been part-walled, or an extramural suburb. 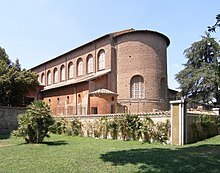 The Aventine appears to have functioned as some kind of staging post for the legitimate ingress of foreign peoples and foreign cults into the Roman ambit. During the late regal era, Servius Tullius built a temple to Diana on the Aventine, as a Roman focus for the new-founded Latin League. The Aventine's outlying position, its longstanding association with Latins and plebeians and its extra-pomerial position reflect its early marginal status. At some time around 493 BC, soon after the expulsion of Rome's last King and the establishment of the Roman Republic, the Roman senate provided a temple for the so-called Aventine Triad of Ceres, Liber and Libera, patron deities of the Roman commoners or plebs; the dedication followed one of the first in a long series of threatened or actual plebeian secessions. The temple overlooked the Circus Maximus and the Temple of Vesta, and faced the Palatine Hill. It became an important repository for plebeian and senatorial records. It is presumed that the Aventine was state-owned public land; in c.456 BC a Lex Icilia allowed or granted the plebs property rights there. By c.391 BC, the city's overspill had overtaken the Aventine and the Campus Martius, and left the city vulnerable to attack; around that year, the Gauls overran and temporarily held the city. After this, the walls were rebuilt or extended to properly incorporate the Aventine; this is more or less coincident with the increasing power and influence of the Aventine-based plebeian aediles and tribunes in Roman public affairs, and the rise of a plebeian nobility. Rome absorbed many more foreign deities via the Aventine: "No other location approaches [its] concentration of foreign cults". In 392 BC, Camillus established a temple there to Juno Regina. Later introductions include Summanus, c. 278, Vortumnus c. 264, and at some time before the end of the 3rd century, Minerva. The Aventine was also the site of the Baths of Decius, built in 252. During the Fascist period, many deputies of the opposition retired on this hill after the murder of Giacomo Matteotti, here ending - by the so-called "Aventine Secession" - their presence at the Parliament and, as a consequence, their political activity. The hill is now an elegant residential part of Rome with a wealth of architectural interest, including palaces, churches, and gardens, for example, the basilica of Santa Sabina and the Rome Rose Garden. The Aventine Hill is portrayed as a rough working-class area of ancient Rome in the popular Falco series of historical novels written by Lindsey Davis about Marcus Didius Falco, a 'private informer' who occasionally works for the Emperor Vespasian and lives in the Aventine. The same image is portrayed in much of the series Rome, in which the Aventine is the home of Lucius Vorenus. In season two, Vorenus and his friend legionary Titus Pullo seek to maintain order over the various collegia competing there for power. The Vesta-class of starships in the Star Trek novels are named for Rome's seven hills. The most featured ship is the U.S.S. Aventine under Captain Ezri Dax. ^ Lawrence Richardson, A new topographical dictionary of ancient Rome, Johns Hopkins University Press, 1992, p.47 googlebooks preview. Richardson asserts the single identity of the two heights as Aventine during the Republican era as commonly accepted in modern scholarship. O. Skutsch, "Enniana IV: Condendae urbis auspicia", The Classical Quarterly, New Series, Vol. 11, No. 2 (Nov., 1961), pp. 252-267, argues that they were originally considered and named as separate hills: the Aventine was the northwestern height only, and the slightly lower southeastern height was Mons Murca. ^ Maurus Servius Honoratus, Commentary on the Aeneid of Vergil, 7. 657. ^ Brill's New Pauly: Encyclopaedia of the Ancient World. "Cacus", 2002. Retrieved on May 4, 2007. ^ For discussion of Remus in Roman founder-myth, see T.P. Wiseman, Remus: a Roman myth, Cambridge University Press, 1995, p.7 ff. For discussion of Ennius' much copied, corrupted and problematic text, particularly his Mons Murca as the lesser Aventine hill, see O. Skutsch, "Enniana IV: Condendae urbis auspicia", The Classical Quarterly, New Series, Vol. 11, No. 2 (Nov., 1961), pp. 255-259. ^ For discussion of Remus in Roman founder-myth, see T.P. Wiseman, Remus: a Roman myth, Cambridge University Press, 1995, p.7 ff. For discussion of Ennius' much copied, corrupted and problematic text, and particularly his Mons Murca as the lesser Aventine hill, see O. Skutsch, "Enniana IV: Condendae urbis auspicia", The Classical Quarterly, New Series, Vol. 11, No. 2 (Nov., 1961), pp. 255-259. ^ Otto Skutsch, "Enniana IV: Condendae urbis auspicia", The Classical Quarterly, New Series, Vol. 11, No. 2 (Nov., 1961), pp. 252-267. ^ Livy, Ab urbe condita, 1.33. ^ Strabo. "Geography", November 6, 2006. Retrieved on May 8, 2007. ^ Cornell, T., The beginnings of Rome: Italy and Rome from the Bronze Age to the Punic Wars (c.1000–264 BC), Routledge, 1995, p. 264. ^ Carter, Jesse Benedict. "The Evolution of the City of Rome from Its Origin to the Gallic Catastrophe"], Proceedings of the American Philosophical Society, September 2, 1909, pp. 132 - 140. googlebooks preview (link updated 27 November 2010). ^ Orlin, Eric M., Foreign Cults in Republican Rome: Rethinking the Pomerial Rule, Memoirs of the American Academy in Rome, Vol. 47 (2002), pp. 4-5. For Camillus and Juno, see Stephen Benko, The virgin goddess: studies in the pagan and Christian roots of mariology, BRILL, 2004, p.27.